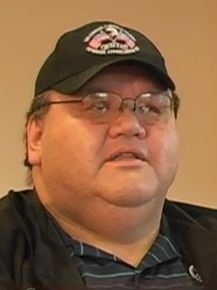 Photo of Don Secena, Chehalis Tribal Council. The majority of Chehalis people reside a the Confederated Tribe of the Chehalis Reservation in rural southwest Washington State. They originally occupied a large area along the Chehalis River. Their name means sand, originally referring to a village near the present-day town of Westport, and later came to be applied to the river and the people living upriver. Originally, they consisted of two divisions: The Upper Chehalis and the Lower Chehalis. Within these were several tribes: the Copalis, Wynoochee and Humptulips people were part of the Lower Chehalis, while the Satsop people were part of the Upper Chehalis. The boundary between the two groups was the confluence of the Chehalis River and Satsop River. Since 1989 to revitalize tribal identity, they participate in the "Paddle to Seattle". Many different Native Tribes participate, including tribes as far as British Columbia and Alaska. They majority residing on the Reservation operate the Great Wolf Lodge Resort in Grand Mound, WA, the Lucky Eagle Casino, and the Eagles Landing Hotel. They also own and operate three convenience stores, two with a gas station; a fast food restaurant, a cigarette stamping business and two construction companies. Pray for Chehalis people to experience a personal and living relationship with Jesus Christ.